The Royal Bissolati Hotel is positioned in the historical Rione Ludovisi district in Rome just few steps away from Via Vittorio Veneto, Piazza Barberini, Villa Borghese, Piazza Esedra, and the sixteenth-century churches of Santa Susanna and Santa Maria della Vittoria, the most evocative places of the Eternal City, rich in cultural heritage, treasures and traditions giving clients a unique experience in the heart of the city and close to luxury shopping attractions. Located in one of the buildings designed between 1932 and 1945 by architect Marcello Piacentini, the Royal Bissolati Hotel welcomes guests in a refined and elegant environment that combines the preservation of the ancient architectural elements with the comfort of modernity. 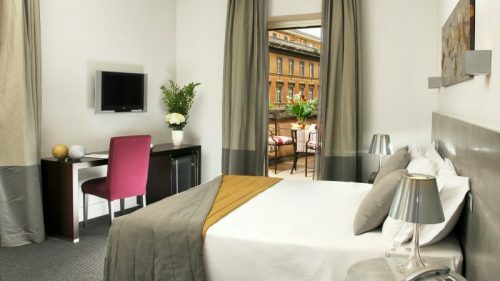 The Opera Hotel, a nice 3 stars hotel, is located in the core of Via Nazionale, one of the most peculiar and well known streets in Rome and offers an amazing view of the rooftops and domes of the Eternal city. The hotel was built in 2006 and allows guests to benefit of tailored facilities to make their experience unique and unforgettable. 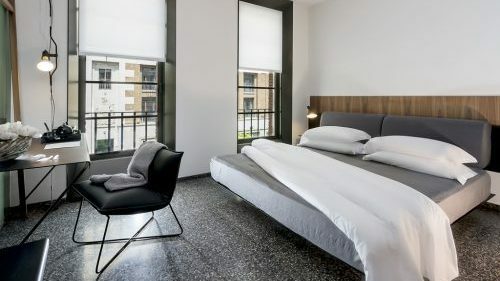 The Opera Hotel has a central and strategic position, as it is surrounded by fashion shops, restaurants and typical bars, is only few minutes far from Piazza Venezia, Trevi’s fountain, Via del Corso and the Opera theatre.